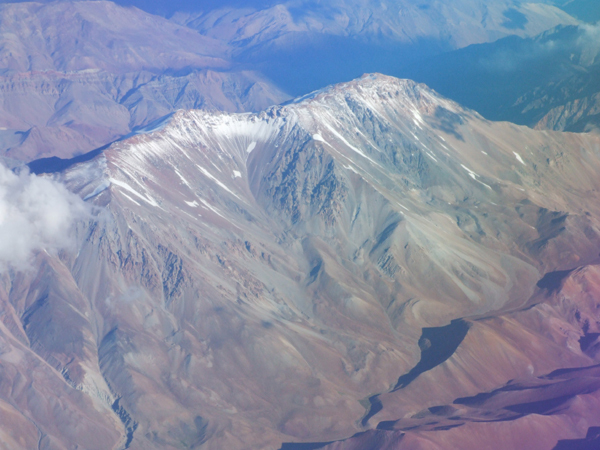 Andes Website - Climbing holidays in the Atacama desert of Chile. Easy High Altitude Mountaineering ascents in central Chile. This expedition will be based in the area of Chile known as the Agua Negra, about a days drive north of Santiago. We aim to make ascents of two big volcanoes over a period of two and a half weeks. 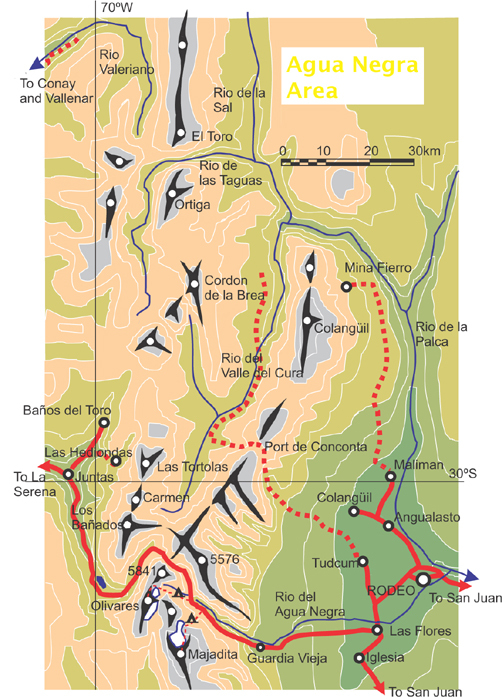 The summits we plan to climb are Cerro El Toro 6168m and Cerro Tortolas 6160m. Both peaks lie on the border with Argentina, but are much easier to access from the Chilean side. During the first modern ascent of El Toro in 1964 a mummified sacrifice victim, dating to the Inca period was discovered on the summit. The ascent of El Toro is a multi-day expedition including a 35km approach trek up a river valley, starting at about 2000m. By contrast the ascent of Tortolas can be made in just a few days from a high vehicle roadhead at approximately 4000m. We'll have a short acclimatisation spell in the Elqui valley near La Serena for three days before we begin the expedition proper. 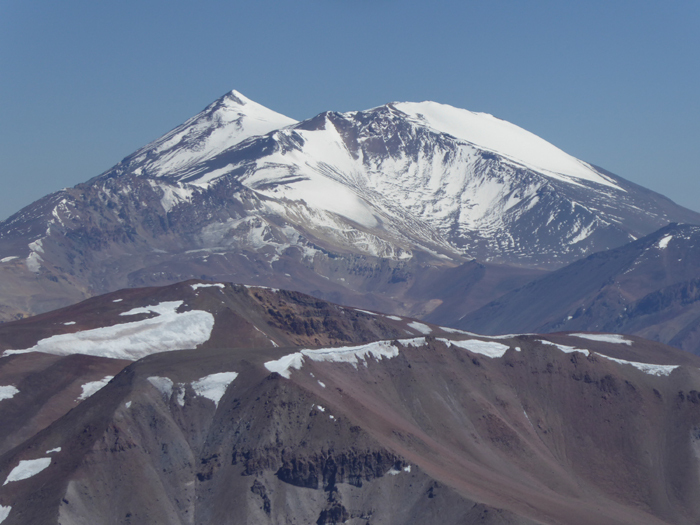 We've climbed in the Agua Negra area on several occasions in the past, including a 2018 ANDES expedition that was successful on the highest peak in the area, Cerro Majadita (6266m). This peak only received its first modern ascent in 1996 when John Biggar first explored the area. Because of the nature of this expedition, which aims to climb a couple of high peaks in a relatively short timescale we advise clients to have made several previous successful ascents to over 6000m. Although the ascents are relatively easy, mostly over scree and rock, clients should be fit and experienced walkers, ideally with some previous mountaineering experience. An ice-axe and crampons are very unlikely to be needed for the ascents in the main expedition, but we will need to have them with us just in case. We can hire these to clients who do not have them, and also instruct you in their use during the expedition if necessary. Day 19-20 Fly home from La Serena. The expedition will fly out to the coastal city of La Serena in northern Chile via the capital Santiago. It's a biggish city with a long beach front, very popular with Chileans from Santiago during the summer months. We'll likely have an overnight here at the beginning and again at the end of the expedition, although this will depend a bit on flight schedules when we all book flights. Our first big summit will be Cerro El Toro, a 6168m high peak on the Argentine border at the head of the Valeriano valley. 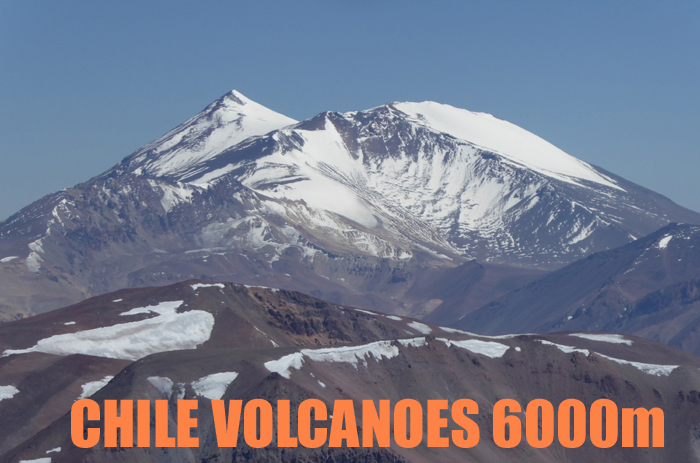 It is often mistakenly reported to be 6380m high. A mummified sacrifice victim, dating to the Inca period was discovered on the summit of El Toro during the first modern ascent in 1964. We'll trek in from the wee village of Juntas de Valeriano (at 2000m), over the course of three days, with intermediate camps at about 2600m and 3100m to reach a base camp near the Laguna Valeriano at 3800m under the west side of the peak. This trek inwards, and the trek out again, will be mule supported. From this base camp we will then climb to the summit over 2 or 3 days, with at least one higher camp. The exact route chosen will largely depend on the availability of snow to melt into drinking water. El Toro from the air, showing our ascent route on the west face. 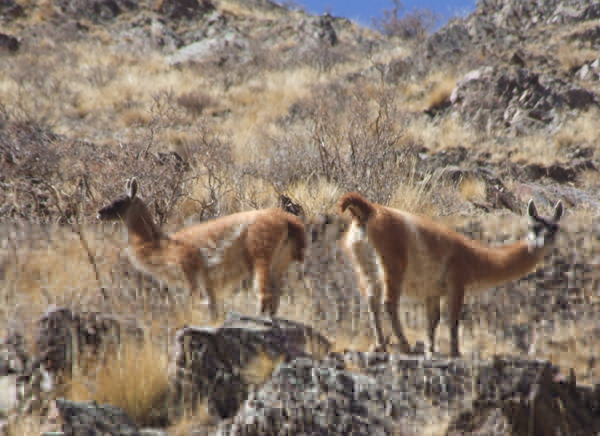 Guanacos are common in the area. Cerro Tortolas is a 6160m high peak on the Argentine-Chile border lying just north of the Agua Negra pass. We'll climb it from a 4x4 roadhead above the Las Hediondas mine, at about 4000m. The first day is up to a small mountain hut at nearly 5000m, then second day to the summit via the north slopes of the mountain, with a third day available in our schedule in case of any delay or bad weather. Cerro Tortolas from the south. Clients should be keen mountaineers or hill-walkers or have previous high altitude trekking experience. For this trip we recommend a previous succesful ascent to over (or around) 6000m, as the acclimatisation schedule is shorter than our average. A good standard of fitness is essential to make the most of this holiday since we will be backpacking for a day or so to reach the high camps on both peaks. Both main ascents will be over rough mountain terrain, including gravel, boulders and occasionally loose scree with perhaps a dusting of snow. Previous winter experience of using an ice-axe and crampons are not needed for this expedition, if we do need to use these items instruction can be given as required. This expedition runs during the long summer season in this part of the Andes and we can expect long periods of stable weather. However there will sometimes be high winds and perhaps a thunderstorm or light snow flurries. During the day it normally feels pleasantly warm in the strong sunshine, but at night temperatures at altitude go down to -10ºC during the 8 or so hours of darkness. Bring a warm sleeping bag and a good book! All clients must be insured for medical costs and repatriation in an emergency. We recommend having insurance for baggage, personal liability and cancellation as well. If you would like further advice please ask. Chile is a well developed country. Vaccinations for tetanus, typhoid and polio are recommended. The country is very safe and relaxing to travel in; theft and muggings are no more likely than they are in most of Britain. 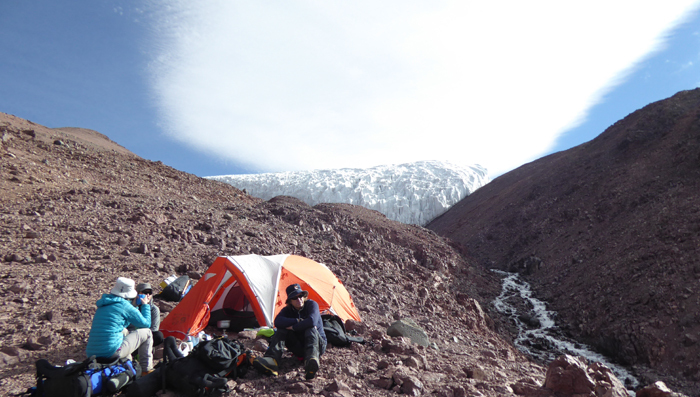 High camp in the Agua Negra, 2018 ANDES expedition. Driving, hotels and general safety : In Chile driving, fire safety standards and general safety standards are not quite as high as in Europe. Remoteness : You will be up to three or four days walk from professional medical help for periods of time. Mountain Hazards : In certain places you may be subjected to a slight risk of rockfall. There are also slight risks from bad weather, including high winds and thunderstorms. Our trips are designed to be small and flexible. The expedition will be co-ordinated, organised and lead by us, but as far as possible will adapt to the plans and aspirations of the members. We will consult you when planning the details of the expedition. Please note however that the leaders decision is final where the safety of the group or any member is in jeopardy; for example where retreat or diversion is necessary due to illness or bad weather. The maximum size of the expedition will be four customers plus leader. Our price is for leadership/guiding and mountain services only. It INCLUDES the leaders fee (wages) and all their expenses, such as flights, travel, hotels, meals, permits. It also INCLUDES his or her share of communal expenses, which may be such things as 4x4 rentals, diesel and fuel, mule and/or porter costs, shared hotel rooms. Our price also INCLUDES all mountain services such as provision of tents, stoves and all other communal camping equipment, all mountain food including all camp food and lunches on day trips. It also INCLUDES any communal mountaineering equipment that may be necessary, and on most expeditions emergency use of a satellite telephone link.